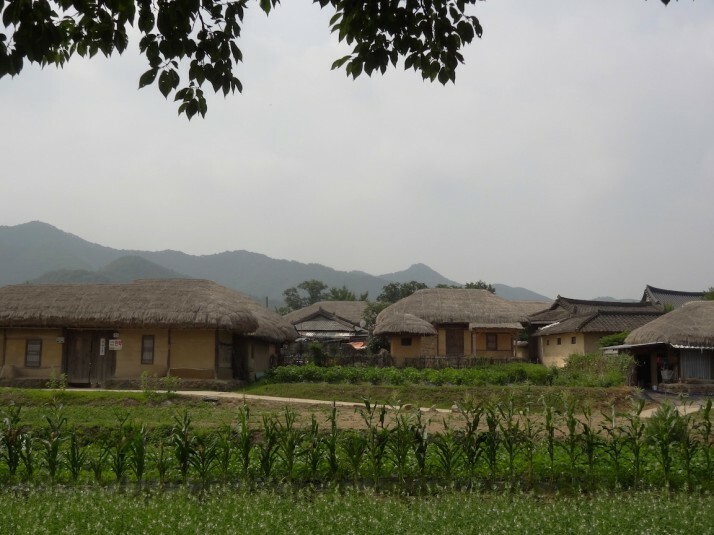 The Hahoe Folk Village, pronounced “Hoehay” for some reason, is a living collection of old houses in eastern South Korea, most of which are still private dwellings or farm houses, but some are open to the public or have been converted into guest houses. Each residence consists of a number of buildings around a courtyard, the most distinctive feature being a mix of thatched roofs and the more typical Asian curved tile roofs similar to those we’ve seen in China and Japan. 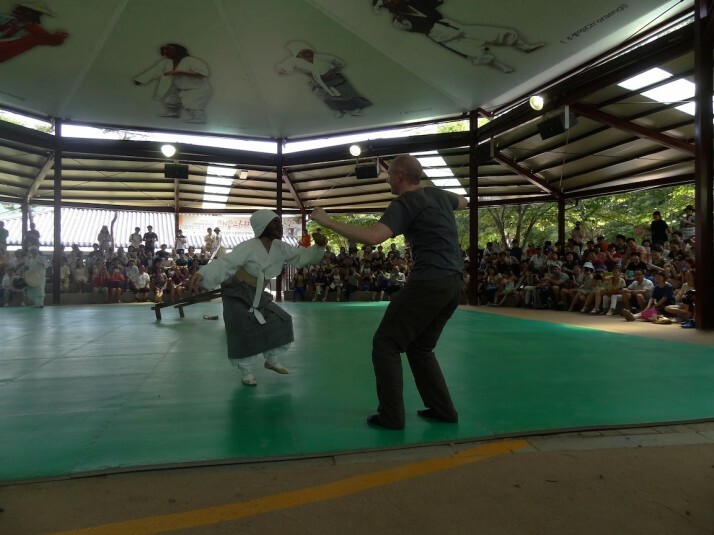 There are a few reasons why Hahoe is inscribed on the UNESCO World Heritage list; it’s famous for being the birthplace of the Ryu family..
.. and the wider Andong area is well known for “Byeolsingut” – a masked dance play that is traditionally performed to wish for much happiness and a good harvest, and which has been preserved at the village. We’d planned our visit so we could see their weekend performance at 2pm. We were initially confused about where the show was due to take place (it wasn’t marked on our map, nor was it well signposted), but we found it in time just behind the Superintendent’s Office and sat down in the front row of the circular open-air theatre. 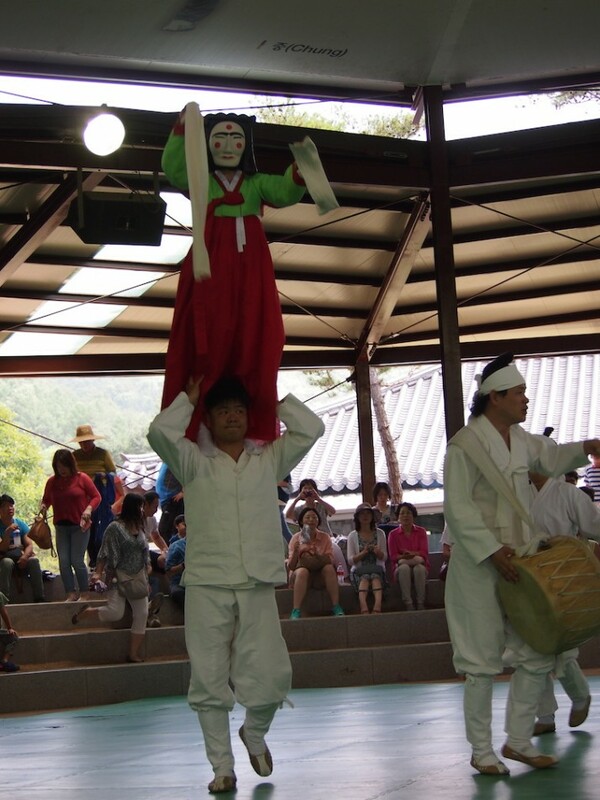 After a long introduction from one of the performers (in Korean), a marching band with simple instruments kicked off the show, shortly followed by a masked woman standing on the shoulders of another performer – we later found out this opening section is to purify and prepare the performance area. The 1 hour show is a series of set pieces featuring different characters, and although all of the dialog was in Korean, it was easy to identify with and relate to the stereotypes so cleverly depicted by the masks and the movement of the performers. By the 4th sketch we were getting quite into it, and then I was asked to get into it.. Dancing with the Old Widow (Halmi madang), who’d just sang a song about how lonely and hard her life is. She can’t be that lonely..
Mercifully (for the audience at least) the ordeal was short-lived, and after a quick bow I returned to my seat to enjoy the rest of the show. Or so I thought.. 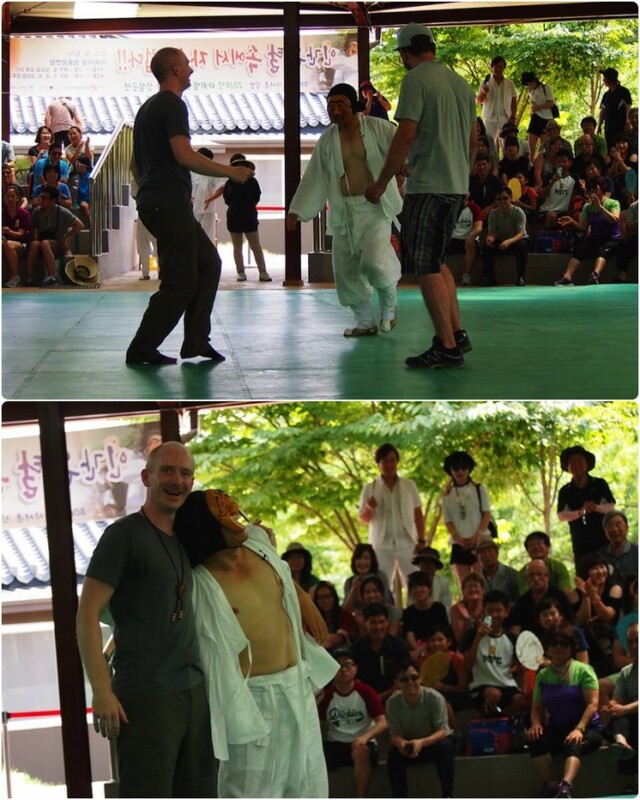 The Drunken Monk decides he wants to dance with two foreigners, and, yep, I was asked to get up and dance again. The other guy is from Canada.. let’s just say that I think I did England proud..
We really enjoyed the show, the masks and the performers were great and it was like a mini variety performance – there was a comedy bit, a singing bit, and a social commentary bit – from what we could make out anyway! Opting to stay at Rak-ko-jae, one of the guest houses in the village, turned out to be a good decision. 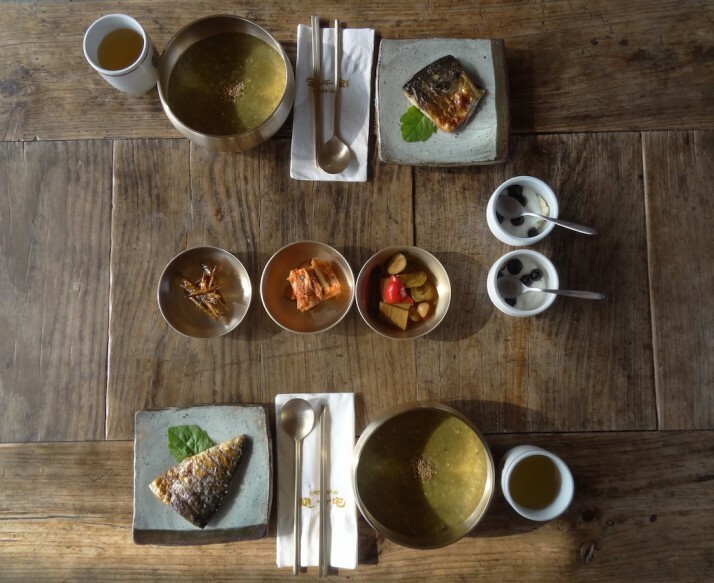 As we suspected, the village was peaceful once all of the day-trippers had gone home, and after the best night’s sleep in Korea so far, we awoke to a traditional breakfast of abalone porridge before a morning stroll where we all but had the place to ourselves. Before we left for Andong city we paid a visit to the Hahoe Mask Museum, which was much bigger than we thought it would be, and as we found out it not only contains local Byeolsingut masks, but masks from around the world. 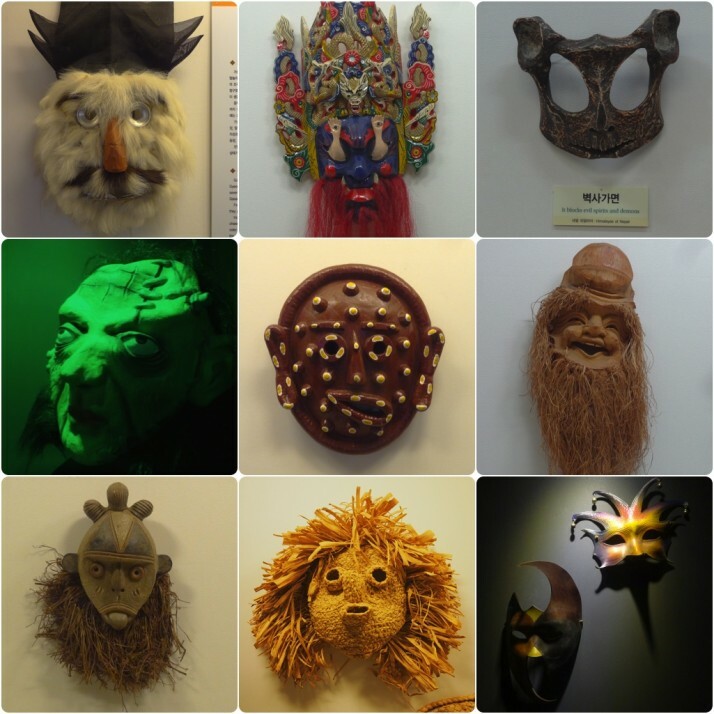 The mask museum was a nice end to our visit as the descriptions explained the show and characters we’d seen on the day before, and finding examples of masks we’ve already encountered made us reminisce about our travels in Thailand, Vietnam and Mongolia. 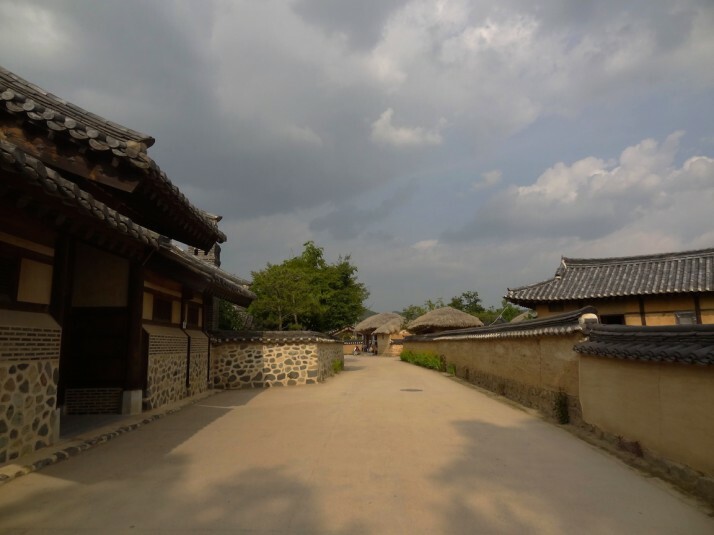 This entry was posted in Places and tagged Andong, Hahoe Folk Village, South Korea on August 2, 2014 by Andrew.